What did he mean? Fr. Luigi Villa said that Pope Pius XII spoke of himself as "the last pope". What Pope Pius XII meant, I can only guess, but from what an SSPX professor at the Virginia seminary told me, it is generally known that Fr. Luigi Villa died as a Sedevacantist. Pius XII himself said he was the "last Pope"
Wrote Jean Guitton (Pantheist and Bergsonian), friend of Giovanni Battista Montini, "Pius XII knew it, he himself said he was the 'last Pope,' the last link of a long chain. And yet in those years of the 1950's, the Church was thriving. But Pius XII knew an unprecedented crisis was in the making, 'in the very bosom of the Church,' as Pius X had already said. And that came about, in fact, with the election of John XXIII. Modernism exploded violently, in spite of Humanae Generis, issued by Pius XII in 1950. Jacques Maritain shared this view: "The modernism of the time of Pius X, compared with the modern neo-modernistic fever, was but a mere hay-fever." In fact, with Pope John XXIII the situation was reversed. The Progressives popped out from everywhere.
. . . John XXIII presently thought of appointing new Cardinals. Obviously, the first, whom he personally dictated, was Monsignor Montini, although he knew that Pius XII had kicked him out of the Vatican, and wanted him excluded from the Conclave, and for that reason he had refused him the purple habit. And we are still suffering from the consequences of John XXIII's action. That too is a clear indication that John XXIII, far from having been a Pope of transition, was a real reformer and transformer, such as the Church had never known since the days of the Counter-Reformation. A new revised Church, today called "Conciliar," (quod dixit Cardinal Benelli). 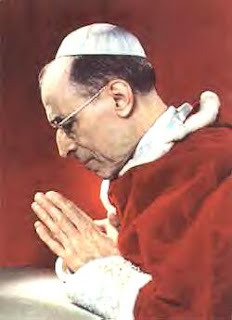 Until someone can explain why Pius XII had Bugnini change Holy Week, it's pretty hard to give credence to all the articles declaring his great holiness. Everyone can make mistakes but wow, that was a whopper and nobody ever talks about it. Yes id like to hear about that too! A few years before his death, while suffering from gastrointestinal problems, possibly due to poisoning, he acquiesced to pressure. He was severely weakened by the war, as well. He made some questionable decisions, but we have to understand the situation in context. I think he felt that all he could do was try to placate the Modernists a little. A few years before his death, while suffering from gastrointestinal complications, possibly due to being poisoned, he acquiesced to pressure. He made some questionable decisions (and appointments), but we have to consider the context. He was severely weakened by the war, as well. He did not have the strength to combat the Modernists full on. After Pope Pius XII died on October 9th, 1958, a nun, Sr Pascalina Lehnert wrote to San Giovanni Rotondo and asked what were Padre Pio’s thoughts on Pope Pius XII. When Padre Pio was asked about the recently departed Pope Pius XII, Padre Pio wore a face that looked transfigured, answered; ‘he is in Paradise.’ When Padre Pio was pressed to give more detail he said; ‘yes, I have seen him in Paradise.’ It is a short, but significant example of Padre Pio’s supernatural knowledge. If only little accounts like this were better known – they would impress nobler and higher thoughts of heavenly realms and what we must strive for. About Padre Pio’s statement that Pope Pius XII was in heaven, Father Agostino wrote in his Diary on November 18 th 1958: "Padre Pio was very sad for the death of Pope Pio XII. But Our Lord let him see the Pope in the glory of Paradise."